To set a unique shipping price for a single product or for many products spanning multiple marketplaces, utilize the tools in Zentail outlined below. To set a shipping override in Quick Edit, first open Quick Edit and click on 'Add Column' in the upper right corner of the screen. The 'Add Column' window will appear. Search for 'Shipping Price Override' and you will see multiple fields appear for selection. Select the shipping price override fields for the appropriate marketplace (Walmart, Amazon, ect) that you are hoping to define. Once a Shipping Price Override is added as a column to your Quick Edit view, you will be able to enter in a unique shipping price override for your selected marketplace. 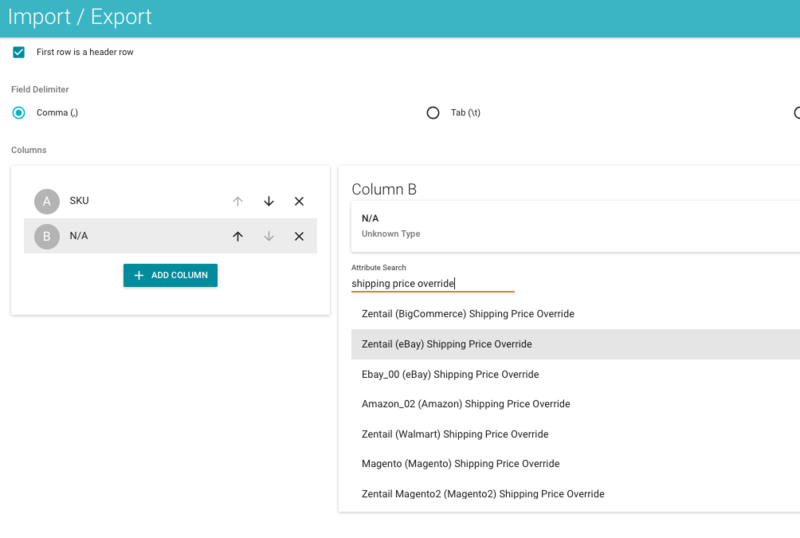 To update many products at once with a Shipping Price Override, create a template in Zentail's Import/Export feature with the columns of Shipping Price Override. Learn more about Import Export here! Shipping policies on eBay must be defined on eBay itself. From Zentail, you can define which product has which policy in Quick Edit, or on a per-product level.